If you enjoy the style of a traditional cottage with all the modern amenities needed for a relaxing and comfortable stay, then Fairview will be your ideal home in Shetland. This 2-storey stone-built house has faced the best and worst of Shetland weather for over a hundred years. The solid walls now enclose a fully-equipped, welcoming and wonderfully comfortable home base from which to explore the rich diversity of the Shetland Islands. The house was built when Gulberwick was populated by nothing more than a few crofts and farms, together with the school and church. It faces landscaped gardens surrounded on three sides by fields and has a wonderful open outlook. 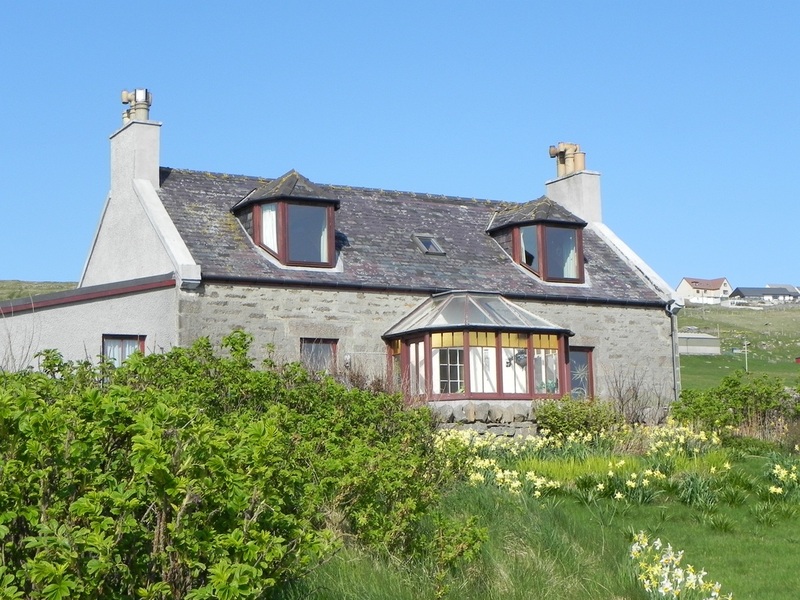 Its location gives it a unique sense of privacy with the beach a 5 minute stroll away, while being only a short drive from all the amenities of Lerwick. The house is deceptively spacious. The 2 twin bedrooms upstairs each have en-suite facilities and ample storage for clothes and personal items. Both bedrooms have dormer windows with uninterrupted views over Gulberwick bay. The open views are reflected in the sense of space in the bedrooms and the warm colours and luxurious cotton bedding make these rooms comfortable places to relax. Downstairs there is a fully equipped modern kitchen with dining area and a large bathroom with generous-sized bath and separate shower area. Also on the ground floor there is a utility room with washing and drying facilities and there are no less than 2 lounges. One of these has a Freeview TV and DVD player, as well as plenty of books to keep you entertained. The other, in a nod to a more traditional style of decoration and relaxation, has a fire place and leather seating for an evening, perhaps with a glass of something fine, in front of a peat fire. And don't forget the sun porch! You might be surprised how often you find yourself sitting there on a summer day with your morning coffee or tea, enjoying the views, the gardens, the fields and the sea. Other facilities include free WiFi, oil-fired central heating and a large Rangemaster dual fuel cooking range with gas hobs and electric ovens.